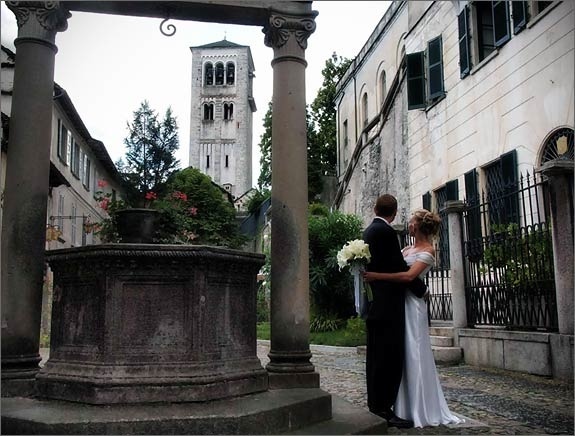 We’ve told you many times about wonderful medieval Orta village and how cosy and intimate it is. here you are San Giulio Island. St. Julius reached this land for first around 1600 sailing on his mantel. He arrived here and found it haunted by dragoons and snakes. He sent them all away and built a little church that after become the nowadays cathedral. This is what the legend tells…. After that a castle, Bishop Palance and villas for priests. About half of 1800 a convent was built and it cancelled the last symbol of a powerful past let the island becoming more religious. Today a small group of nuns live in the convent. They are Benedectines and they are totally dedicated to manual works and spiritual hospitality. St. Julius Island is a silent an mystic place rich in history and traditions. If you take a look to the island from the hills high tower bell, gardens and ancient roads look like a fairly tale castle born from ancient ruins of a castle. On this very Italian corner of paradise we would like to suggest a unique opportunity to arrange your wedding reception: a little cosy restaurant with terrace on the lake inside one of the most ancient villas of the island. 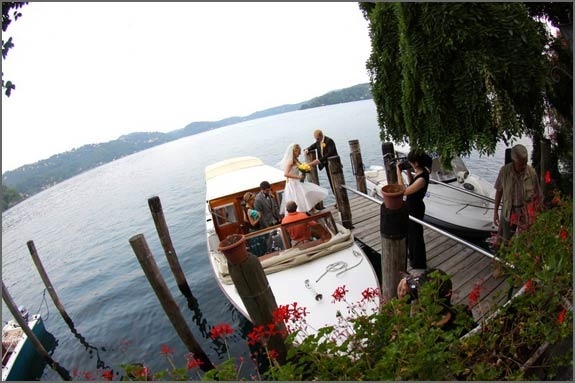 We love to imagine a romantic civil ceremony to Villa Bossi or a lovely religious ceremony in one of Orta churches (Maria Assunta or Sacro Monte) with a pleasant trip on the boat to follow. 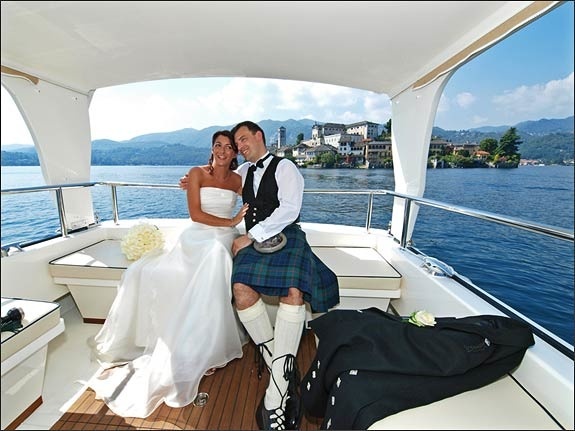 You and your guests will have the opportunity to completely know and savor the beauty of the lake. Cruise from Orta to St. Julius Island is a show you can not miss. From the waters could admire ancient villas on the shores and their aristocratic and alter appeal. 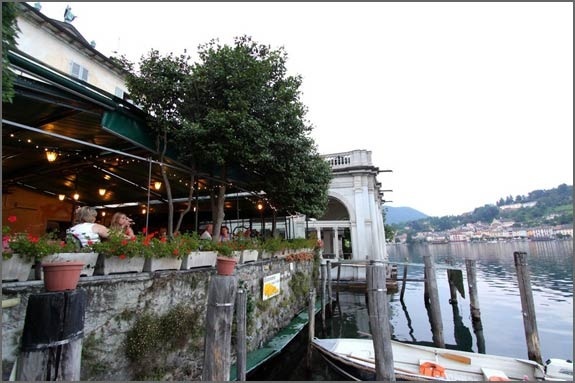 After this lovely trip you will arrive directly on the pier of a little restaurant just on San Giulio Island or you could get there from the little road that goes across the Island. Restaurant is located inside Villa Tallone date back to 1700. It is well know to host a rich summer concert season in which you could listen to great concerts in such a wonderful frame. Restaurant has a wonderful terrace where we suggest to arrange your wedding dinner. It is the ideal place for a traditional Italian style dinner with a touch of elegance and atmosphere. 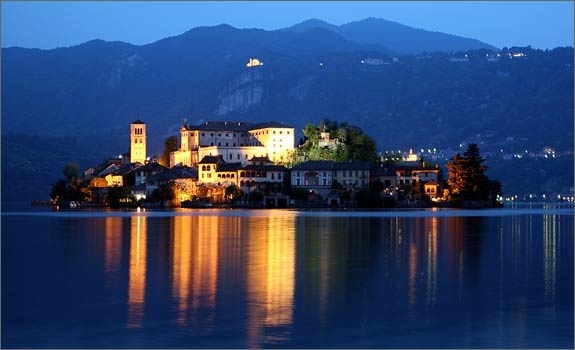 While tasting the best dishes of local cuisine you could enjoy a great view on the lake, Orta village and other villages nearby. Just imagine a candle lit dinner and scented flowers as frame of the event. The terrace could host up to 120 guess for a unique reception. Restaurant has also beautiful rooms inside on the upper floor. They are very precious with their paintings and frescoes. They can host smaller and more intimate receptions even during summer season. From the windows you will admire unreal beauty of the view. 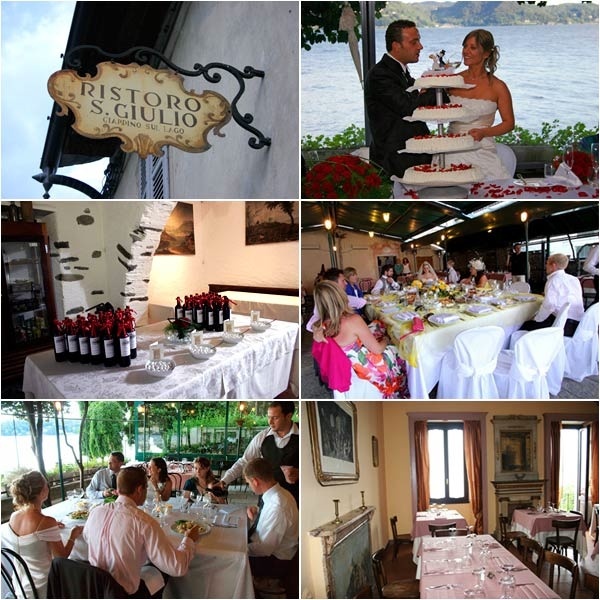 Just consider that the little restaurant is the only venue available on little San Giulio Island. You will have the occasion to have at your disposal a real and unique corner of Italy for unforgettable memories. Ahhh being in Italy alone is breathtaking, what more for a wedding! I love the photos! 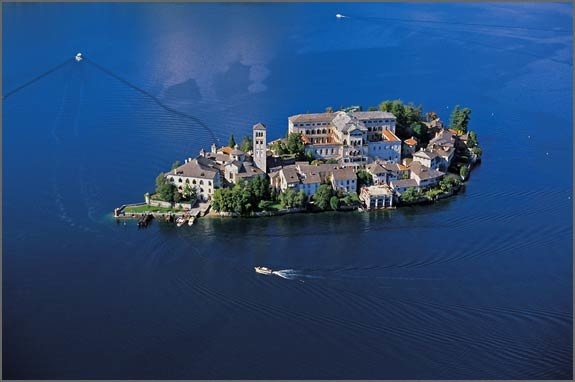 Looks like I’m adding San Giulio Island on my list of must-sees! Valentina did a great job, judging by the looks on the brides and groom. Looks like they didn’t have to worry about a thing. Thank you so very much Michi for your lovely appreciation. 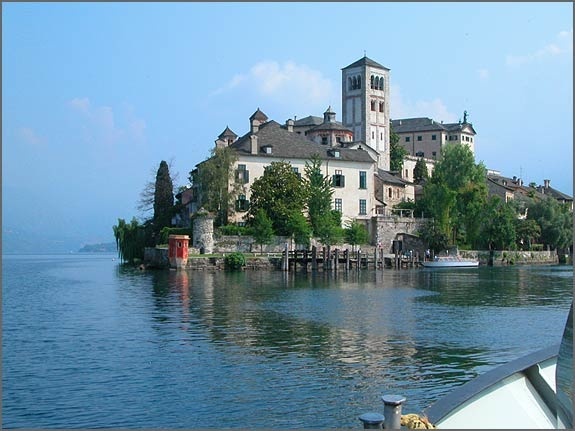 I have been in Lago D’orta once, I loved it. Now I got engaged and looking for the place to marry and looking at this website. Lovely photos! !Its a place where I would love to get married!!! 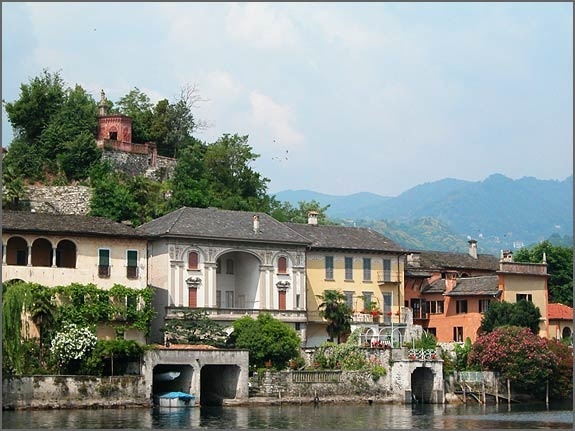 I am planning to come to San Giulio Island again this february. I would like to meet up and to see the venues.Hope that it would be ok? thank you for your lovely comment here! Congratulations for your engagement!! I would be happy and pleased to meet you in February to show you this wonderful spot of Italy. I think I have your email through the web site but we could discuss about this via email. I will send you some more images presentations and proposals if you want and we could also arrange our day together. In case you want to write to me this is my email. Speak to you soon and thanks again for your nice comment!